As mentioned yesterday, the Cleveland Browns are once again in another offseason where a question mark is hovering over the position of quarterback. It’s still undetermined just which route the team will take to try and fix this, but all reports indicate it’ll be actively on the hunt in the coming months. Theoretically, this would indicate the Browns are convinced the solution isn’t on their current roster. If you watched Cleveland at all this season, you’re likely convinced of this as well. 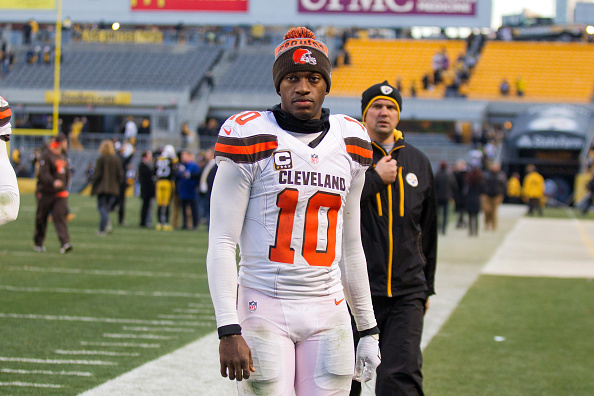 Neither rookie Cody Kessler or veteran Robert Griffin III did enough to reassure the Browns they have a fix at QB. While the jury is still technically out on Kessler, it’s a different story when it comes to Griffin. Coach Hue Jackson made rehabilitating the former Rookie of the Year’s damaged career a personal project this season, seeming hell-bent on making him a viable starter once again. Even despite the fact said experiment was a dud, many believe Jackson’s hubris might lead to him giving Griffin another season at the helm. For Jackson’s sake, I hope he’s taken plenty of time to reconsider. In fact, if the Browns were smart, they’d make cutting Griffin an offseason priority. To be fair, there was something admirable about Jackson’s attempt to try and repair Griffin. He was electric during his rookie year in Washington, and despite careening off the rails in epic fashion, you had to think there was still some potential to be found. Progress was seen throughout training camp and during the preseason, and it seemed as though Jackson might pull off a miracle. When the season started, those doubts were almost immediately erased. Well, not with everyone, I guess. Griffin himself claimed he proved people wrong this year, a statement which is astoundingly false. He still couldn’t stay healthy, his completion percentage and QB rating were the lowest of his career and concerns about his pocket awareness or his read progressions remain just as significant today as they were before the season started. To be blunt, Griffin still doesn’t look anything like a franchise quarterback, and nothing he provided this year indicated things will change if he gets another go in 2017. Again, if Jackson and the Browns were smart, they wouldn’t let things get that far. I can’t think of one reason why heading into another year trying to lean on Griffin as a starter would be the right call. Hammering this thought home is the fact the Browns have numerous routes they could pursue to find a notable upgrade, and more than enough resources to utilize in each one. An obvious choice is the draft, especially since Cleveland possesses both the No.1 and No.12 overall picks. The Browns’ gluttony of draft selections in general puts them in a great situation to find a quarterback through a trade, a la Jimmy Garoppolo. Additionally, Cleveland has so much cap space you’d think it was trying to set a record for such a thing. Should there be a viable option available in free agency, the Browns will have more than enough money to work with. Considering all of this, heading into the next season with Griffin as their starter would be an utter waste of the resources the Browns have at their disposal. What it will come down to, it seems, is whether or not Jackson can admit defeat here. Cleveland’s coach made no bones about his desire to see Griffin to succeed. When the quarterback struggled, Jackson seemed reluctant to throw criticism his way. The increased attention he gave Griffin has more than a few people, myself included, fearing he has no intention of giving up on this experiment. One would hope the amount of rumors and reports about the Browns looking literally anywhere else for next year’s QB indicates Jackson has finally come to terms with what everyone else already knows – Griffin is not the answer. Going back to him in 2017 not only would prevent the team from progressing, it might even send it further backwards. Griffin’s unreliability in terms of both what he gives the Browns on the field and how often he’s knocked off of it would only muddy the team’s quarterback picture further. As a result, it’s time for Jackson to call this project what it is. It was a bold move, but one which didn’t pan out. We already know Griffin isn’t part of the Browns’ long-term plans, so what’s the point of dragging things out longer than necessary? This offseason, Cleveland needs to bring to an end its latest failed attempt to find a franchise quarterback. The sooner it does so, the sooner it can begin finding another, and hopefully better option.